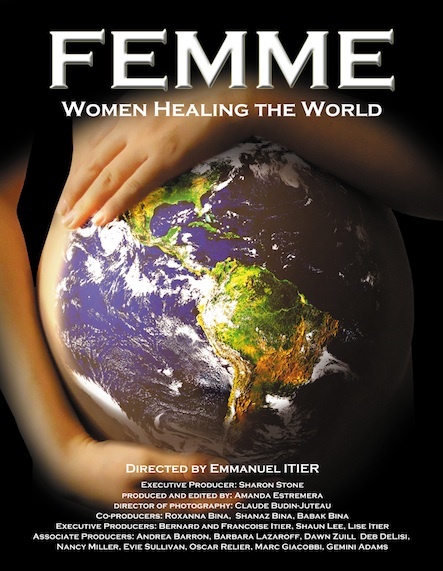 FEMME: WOMEN HEALING THE WORLD ~ For all those men and women, who know how to nurture! For Mother’s day I wanted to share with everyone my recent interview with a filmmaker who does indeed believe in ‘women healing the world.’ And I am honored to be a part of his new documentary film as a co-producer with my husband Nazim Artist as well as being honored to be interviewed in the film. FEMME: Women Healing the World. Emmanuel Itier has just become a proud DAD just in time for Mother’s day to precious baby MAX! Besides being a wonderful Dad, he is also the genius behind the amazing documentary entitled, The Invocation which is a documentary about God and a call for Peace. This film is indeed a must see! Here is a video excerpt from my conversation with filmmaker, Emmanuel Itier for the new film. In turn, I interviewed this brilliant filmmaker, Emmanuel Itier for us here at my Celestial Musing blog for Care2 as I wanted to share with you all just a bit about who the man behind FEMME is as well as how he expresses his passion about bringing this powerful message to the screen that so beautifully honors women globally. CY: What do you hope Femme will accomplish? CY: What is the vision quest of this exciting film project? EI: Femme is a vision quest which has sought out and now shares the most important and influential women around the world. We meet them in their daily lives, and where they are making a difference, through religion, spirituality, science, history, politics, philosophy and entertainment. We have been meeting and interviewing various leaders in each of these fields as well as interviewing unsung, heroic women who are living in the many geographical areas that we are visiting. CY: Share with us, Emmanuel, who you and your team members are. CY: Tell us about the structure of the documentary. Since our world is changing we see that women are more present today at all levels of leadership. Who are these women, and how can they change our world? “All of the women in the film represent not just the feminine spirit, of mind and body but are truly a force to be taken very seriously. We explore, one conversation at a time, the relationship that these fantastic women have with their own personal vision. They share intimately, how they deal with the fact that they are women and face the adversities and limitations that have been imposed upon them by a male dominated society. How they overcome the day to day difficulties and clichés rampant in societies all over the world. We then see how their vision and or ‘business plans’ for a new world are in many cases, already in motion and NOW being felt at every level of our society. CY: How will this film look? What is the image system at play here? EI: “We have a mix of traditional ‘beauty’ shots which we are filming as we travel to the various places around the world, we use footage from the various interviews we have collected from our selected list. We want very much to engage our audience and make them feel a part of our journey of discovery. Our filming style for this documentary is somewhat unique as we invite each interviewee to interact with the camera, to speak into the camera as if they were speaking to the audience themselves in a ‘one on one’ manner. We are presently in negotiations with our prospective narrator, a very famous person known for his political and humanitarian spirit. This individual will also do some voice over work in between the various segments. We don’t want to make a film with any “talking head” types. But, we are very keen for the film to be full of energy, humor, and deep thoughts expressed by deep thinking women from all walks of life. Also, a beautiful soundtrack will be made up of various musical styles which will enhance the tone of the film and give it a pulse and rhythm all its own. The Invocation,has a proven success formula and that is being applied again to Femme. EI: “You know, Celeste, women used ‘to rule the world!’ In ancient times, it was believed that earth had been created by a Goddess and Mother Earth embodied that spirituality. What was true about it and what became a myth is a very big question and I would like to attempt to answer why this shift to all things masculine happened in this film. I think it will be made clear, as it seems to me that with the birth of the three main monotheistic religions, Man pushed the Women outside of the temples and declared himself a living God, complete with the masculine pronoun professing it, in most languages we find God named only in the masculine tense and that helped to sell it as truth. With so much gender bias we have to wonder what happened truly and what is the role played by women in today’s society? What defines a woman today? Just like all human beings, women are faced with some essential questions they themselves, need to answer in order to find the true meaning of their own existence as women and their appropriate place or position in the world today. We will delve into the feminine ‘spirit,’ raise a magnifying glass to her beautiful mind and see through the eyes of some very enlightened women as to how they view this ever changing world. We will look at the physical presence of women and how on an energy level they are so important and complementary to us, men. Finally, we will redefine the role of women now and see how women can save our world from destruction. We will also do our best to reestablish a new and fresh approach for a better relationship between men and women as equal partners. CY: I am so honored to be included in this amazing project, Emmanuel. How can people find you to learn about how they might be of help in this endeavor? In summery, if we each believe we can play a role in healing the world, let it be written, and let it be done!